Although the general consensus is that people should drink between six to eight glasses of water per day, dietary requirements depend on an individual's body size and metabolic factors, such as the amount of daily exercise or exposure to the sun. Low water intake is defined by the U.S. CDC as less than 4 cups per day, and a study from last month found about half of America falls below this mark. What does this mean for the average person, who might not be drinking enough water, but is far from being clinically dehydrated? Are there subtle effects on the body caused by low levels of water consumption? Led by Dr. Caroline Edmonds, researchers in the UK recently conducted a study showing that even mild dehydration has a negative effect on the brain's performance. Drinking water, the researchers found, can improve the brain's ability to complete tasks that require a rapid response. In particular, the improvements were greatest among those who felt thirsty. Thirty-four subjects were asked to abstain from food and drink for a night. Then they were tested with the CANTAB battery, a computer-based assessment that measures a variety of mental abilities, including verbal skills, visual acuity, and learning. The researchers, who were led by Dr. Caroline Edmonds, found that providing a glass of water immediately before the participants took the exam boosted mental reflexes, specifically reaction time, by 14 percent. Subjects marked down how thirsty they were feeling on a scale from one to 10. 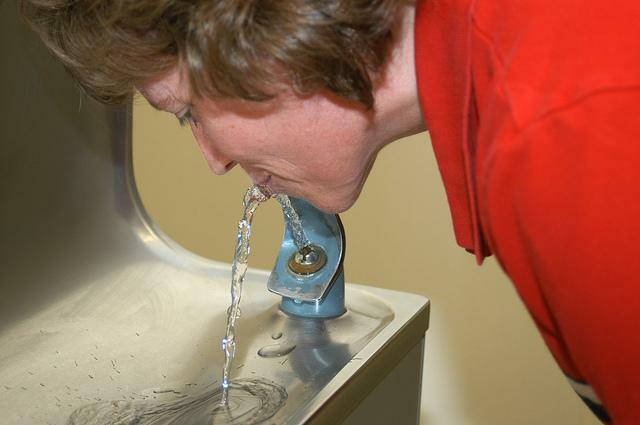 Reaction times ran 14 percent shorter after drinking water. People with the greater cravings experienced a bigger mental lift after being re-hydrated. Unexpectedly, though, performance on another task dipped; the participants ability to complete a complex-rule-learning task became slightly worse after drinking water. The authors suggest the need for future research in order to determine why drinking water may be beneficial for some cognitive tasks yet not for others. Essential for survival throughout our lives, water balance in our bodies changes over time. The percentage of water compared to body mass may be as high as 75 percent in a newborn baby, but it progressively decreases over time to approximately 55 percent in someone who is elderly. Thirst sensation also decreases with age, probably due to changes in the sensitivity of osmoreceptors. Osmoreceptors are cells that are sensitive to osmotic pressure, which reflects the concentration of solutes in the body, such as salt. This is why, in healthy people, the consumption of salt prompts a thirst response. Due to normal changes associated with aging, the osmoreceptors of adults become less sensitive, and consequently they often do not recognize when they should drink more water. Thus, middle-aged adults need to become aware of their declining ability to feel thirst. It may be prudent to begin to teach yourself to drink regularly, even when not thirsty, beginning in early middle-age. Source: Edmonds CJ, Crombie R, Gardner MR. Subjective thirst moderates changes in speed of responding associated with water consumption. Frontiers in Human Neuroscience. 2013.